…once he slows down from the 2,000 or so RPM that he must have achieved in his grave, I hope that Edgar Allen Poe can find it in what remains of his – by now dusty – heart to accept my sincere apologies. Raven: An avalanche of dank hops teeter on the edge of a long drop into darkly enticing malts. Perfectly balanced on the knife edge between hops and malt. Revelatory. Troublemaker: Hops nowhere near as prominent as Raven. Dark malts win out by a country mile. This is where the lack of things like a hop-back or hop-rocket show-up. Needs way more hop aroma. 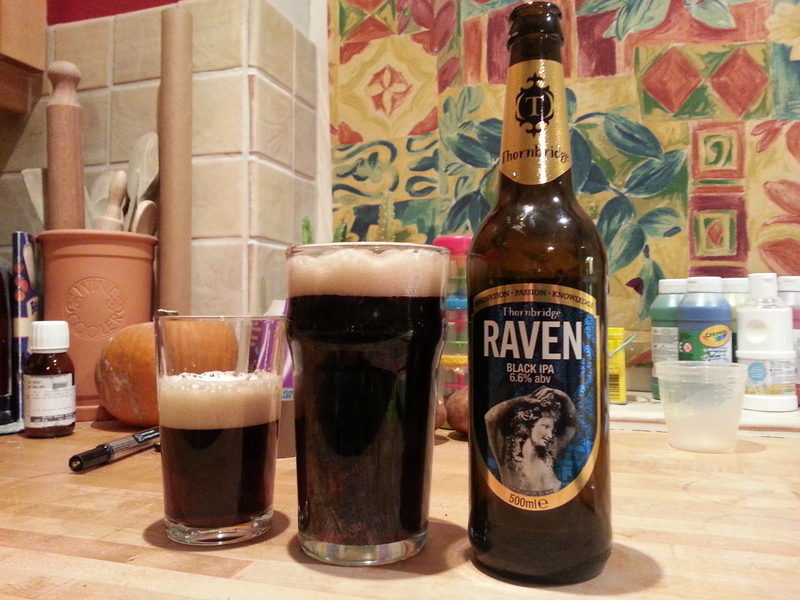 Raven: Resinous, dank and vivid hop flavours explode over a dark malt undercurrent. A solid malt body with a nice 6.6% ABV contributes to a decent mouth-feel whilst a satisfying bitterness provides air-cover for further random attacks of hop flavour through the swallow. Troublemaker: Some Cascade hoppiness vies with -and probably loses out to, if I’m honest- a roast malt background. The hop flavour fades quite quickly to be replaced with that nice, but certainly not to style, dark malt. A decent-enough bitterness prevails at the swallow and offers a few glimpses of the residual hoppiness. At 5.3% I also think it’s a bit thin and needs an extra 1% heft. Raven has definitely shown me what needs to change in the Troublemaker recipe: a ton more hops, a longer hop stand and way more dry-hopping. It also needs more bitterness and a more alcohol. But saying all of that, it’s eminently drinkable – although clearly not a Black IPA/Cascadian Dark Ale. Maybe I’ve invented a new style: Indian Dark Porter? But, holy cow, black IPA is where it’s at; I’m liking it a lot and Raven is excellent and very much a beer that I’ll be returning to -and trying to brew myself- again and again. Here’s another beer from another of my local breweries. Wychwood are the folks we must thank for saving and reviving the old Brakspear brewery name and line of beers. I’d buy Wychwood beer on the strength of that alone, so it’s something of a bonus that their own beers are very nice indeed too. 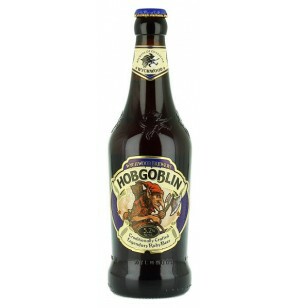 Hobgoblin pours a very deep garnety-brown and is clear as a bell, albeit very dark in colour. The carbonation is strong and healthy. Aroma-wise it’s strongly malty with a touch of sulphury-mineral earthiness. I think it’s probably crystal malt that makes up the bulk of the aroma. The taste is deeply malty, with a theme of red berry fruits and an excellent malt-sweetness. Hobgoblin isn’t desperately bitter, but the lovely lingering fruitiness coupled with a dryish finish more than makes up for that. The alcohol is just about detectable but doesn’t poke out – being content to simply bed down and contribute to the other flavours. All-an-all a good solid mouthful of beer. No wonder Hobgoblin sells so well. Ahem. Yes it’s true. 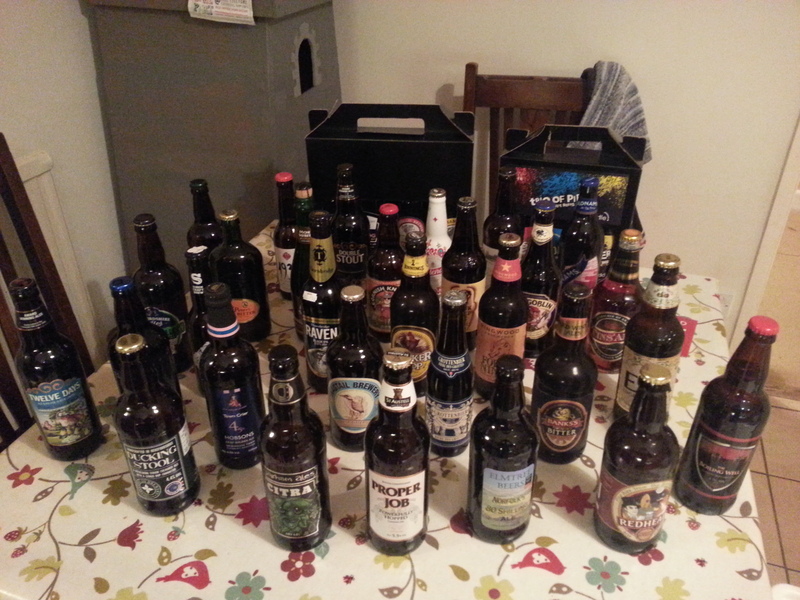 What with over-stocking, plus receiving more than a few bottles for Christmas I seem to have got myself a bit of a backlog to work through. But, hey, it’s a tough job and someone’s got to do it. And yes, each one of these bottles is different…the duplicates – or swapsies as I like to think of them – are still cluttering up the larder. That and another 15 or so litres of Kipling clone, oh and a keg full of Cascade dark IPA -both made by me. Ah, lovely old Hook Norton Brewery. My local brewery. They’re always there when I need a drink to depend on. Even though they might not be the most exciting and dynamic of brewers, you know that whatever you choose from their range will almost certainly be solid and well-crafted. 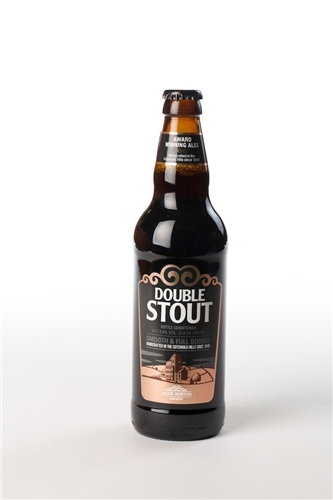 Double Stout when in a glass is broodingly good looking, dark and possesses a splendid head of dense tan foam. As stouts go, this stuff looks the part. Roastiness, dark grains and a nice almost whiskyish, lightly-charred barrel, sort of thing are going on in the aroma. My imagination made me think I might have picked up a touch of vanillin too…a bit like it’s been conditioned in wood; but I’m fairly certain it isn’t. Let’s just say that it’s quite a complex nose. A good solid, creamy mouth feel with a mild, befitting, carbonation makes for a velvety, smooth texture. An overall theme of gentle roastiness, light dryness and a non-intrusive bitterness helps to complete the picture. This is probably one of the best introductions to stout that you’ll get. No acrid black malt/over-roast barley in the taste at all…whereas Guinness is sometimes prone to the mouthful of manky old pennies taste which I know is off-putting to a lot of non-stout drinkers. Light roastiness on the aftertaste and a little bitterness that helps to accentuate the roasty theme. It’s not a world-shaking taste at all, but it’s good, well-made, solid and dependable. 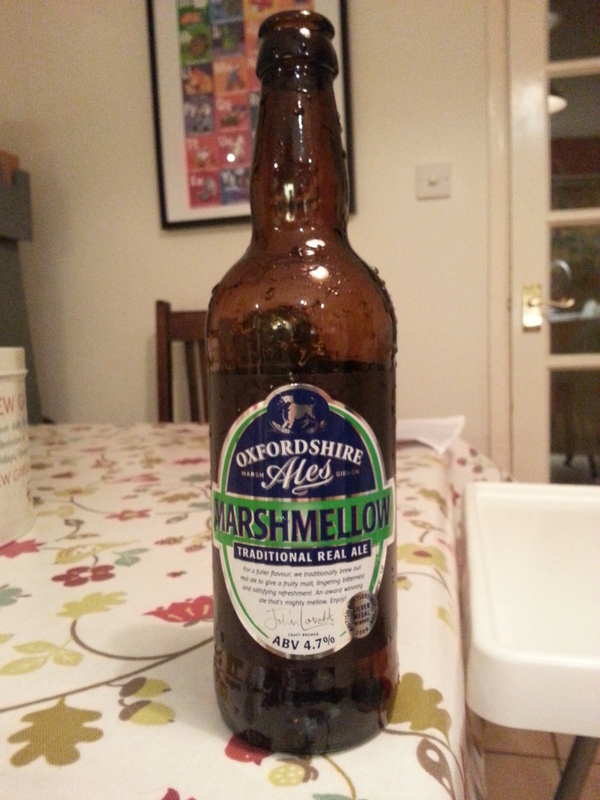 Pours a nice amber colour with an attractive faintly off-white head. There were some hop notes in the aroma, which together with the maltiness, left me hopeful of good things from this beer. A nice standard sort of Best Bitter theme, with a decent enough dry finish. English-accented hop flavours and a solid malty body make Brainstorm a good bet if you should see it on tap.